This is a pretty amazing work. 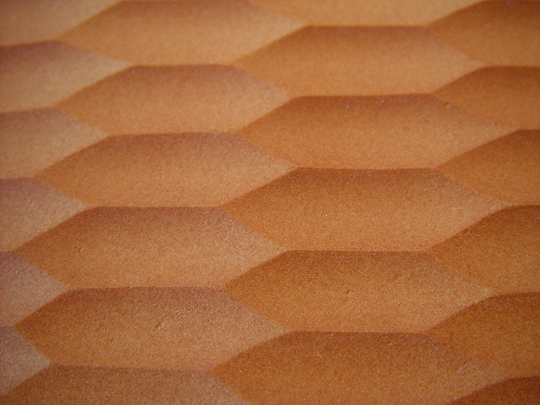 After he created this plate, Ikuzi carved an array of amazingly similar hexagonal cells into its surface. He then airbrushed each cell so that one side of the cell is darker than the other; this enhances the shadow effect within the cells, making them appear to be lighted even when they aren't. 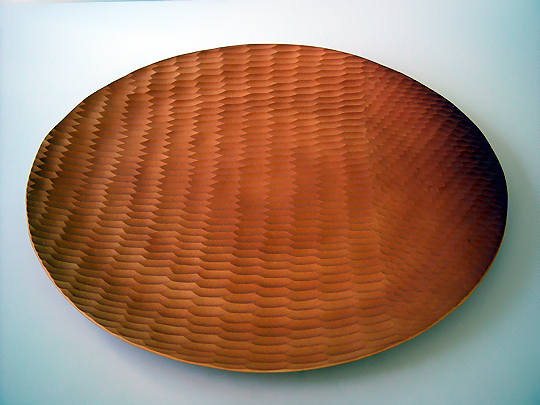 (It also makes the plate appear to be made from carved wood... that's one of the reasons I like this plate so much.) On one edge of the work, the pattern is rotated and the airbrushed colors are somewhat darker... this gives the work an added dimension that would be missing if the artist had just stuck with the same pattern for the entire work. To me, this work has a very Zen quality about it... its design is quite simple, yet the effect it produces is very profound. It's meant to be functional, as well, but I just can't see putting food on it.